With uncertainty clouding almost all China stocks, there has been a fall of epic proportions. Many Chinese stocks have fallen over 75% in the last few months, dumping to levels never imagined. Growth rates in these stocks are unparallelled in the United States, or so they would have you think. These falls have been due to accounting issues, mostly in RTO's. RTO stands for reverse takeover and describes a company getting listed in the United States by buying a shell company that is already listed. In this case, this allows the Chinese companies to avoid much of the due diligence done prior to allowing a listing on the U.S. exchanges. Just yesterday, China-Biotics Inc. (NASDAQ:CHBT) was halted as they said they would delay the filing of their annual report. These accounting issues seem to be stemming from the companies reporting on contracts that actually do not exist. In other words, inflating their stock prices with phony revenue and earnings streams. Get the next small cap blockbuster. Countless stocks have been halted and delisted because of these issues and more are sure to come. However, there are many valid companies with solid accounting that have been punished in sympathy. The question..which ones. While the current arena still leaves more of these problem stocks to be discovered, within months whichever stocks are left standing, will allow for one of the best buying opportunities in history. Find the stock that is trading at a 2 P/E because of fear and should it be legit, it may have hundreds of percentage points to gain in the next year or two. 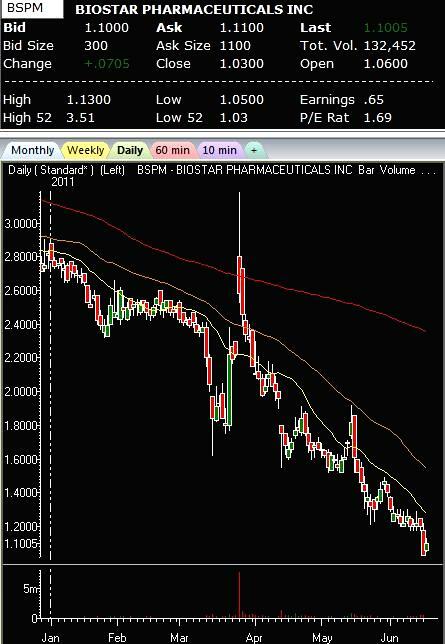 Some possible plays to watch are Biostar Pharmaceuticals, Inc. (NASDAQ:BSPM) which is trading at $1.10, Zoom Technologies, Inc. (NASDAQ:ZOOM) trading at $2.20 and ZST Digital Networks, Inc. (NASDAQ:ZSTN) which is trading at $2.71. These are just examples of Chinese plays to watch. There are many others as well. The key will be, once the due diligence has been completed and most of the fraud has been rooted out, which are left standing.